Throwback to Week 1 of the 2017 football season. The New England Patriots were coming off a historic Super Bowl victory and were beginning the new season on a Thursday Night Football opener against the Kansas City Chiefs. The game was at home at Gillette Stadium; the Patriots and their fans were celebrating a recent Super Bowl win; and they were excited to get a new season rolling. Right? Wrong. 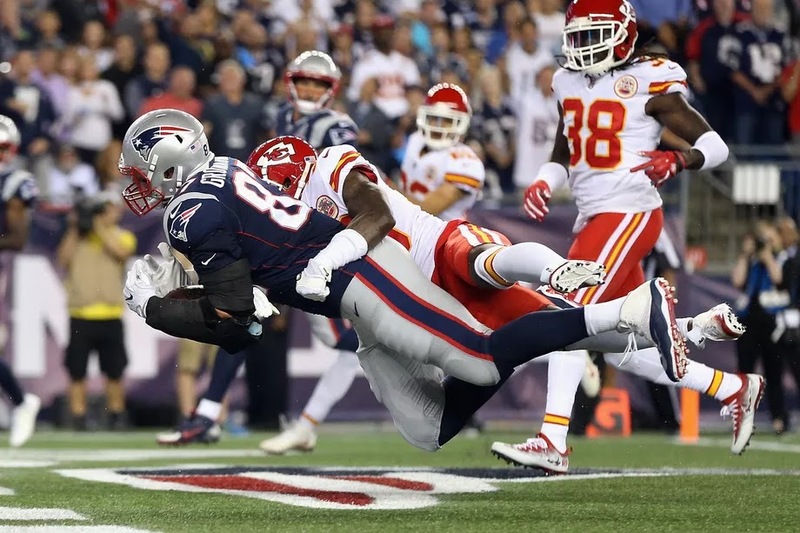 The Kansas City Chiefs strolled into New England and handed the Patriots a 42-27 loss in a stunner of an opener. The sky was falling in New England. The Patriots were done. 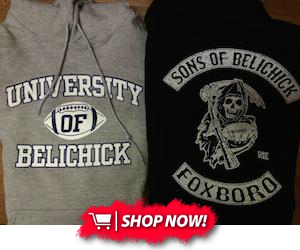 Until the team marched its way back into another Super Bowl appearance the following February. Kareem Hunt stole the show for the Chiefs that game, scoring three times with 246 yards from scrimmage – the most by any player making his debut since the 1970 merger. Alex Smith also had a very strong outing that day – becoming the first quarterback with 300-plus yards, four TDs and no interceptions, against a Bill Belichick-led team. Oh and not to mention, the 42 points the Patriots allowed were the most in Belichick’s 17-plus seasons. Good start to the new season right? This time around, the Patriots are hoping things go completely the opposite as the last matchup with the Chiefs. But they’ll have their hands full with a Patrick Mahomes-led offense and a team that is red hot at the start with a 5-0 record. Tom Brady was just 16-of-36 with 267 yards passing, while Alex Smith went 28-of-35 with 368 yards and four touchdowns. 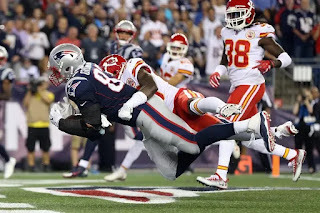 Mike Gillislee led the way for the Patriots’ rushing efforts with 15 carries, 45 yards and three scores; while Kareem Hunt was the Chiefs’ all-star – rushing 17 times for 148 yards and one score on the ground. Hunt also added five catches, 98 receiving yards and two scores through the air. Danny Amendola caught six passes for New England and racked up 100 yards on the night for New England. Tyreek Hill had seven catches for 133 yards and one score for Kansas City. Devin McCourty led the way for the Patriots’ defense with 10 total tackles, including nine solo; while Ron Parker notched 11 total tackles, including 10 solo for the Chiefs. The 5-0 Kansas City Chiefs make their way to Gillette Stadium to face off with the 3-2 New England Patriots for a Sunday Night Football matchup this week. While the Chiefs are undefeated, New England is hoping to ride high on the energy they’ve picked up from their back-to-back wins. Game time is set for 8:20pm on Sunday, Oct. 14, 2018.